Home Hot News DD enters Fashion Show after Fight with Vijay TV ? DD enters Fashion Show after Fight with Vijay TV ? Vijay TV’s all time Favorite VJ Divya Dharshini. She had stooped from anchoring in Vijay TV program for the past 2 months. All of a sudden rumor started spreading that there was fight between Vijay TV management and DD and some say that it was all because DD is pregnant now. And some say that she had a good offer from other companies :P . Only DD knew what is the truth ! In this case DD attended a recent Fashion Show in Chennai and the images in the fashion show went viral over social media. 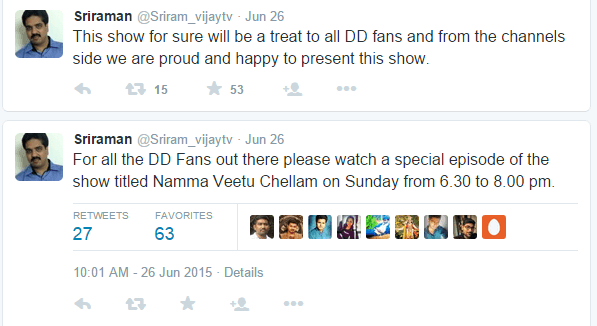 Everyone doubted that whether this is for a time pass or because of the real fight with Vijay TV ?